Now onwards, Form 16A text file will be available at TRACES web site only. When will Form 16A file be available? You can either download file for all PANs or for selected PANs. For all PANs ,you need to select FY and Quarter. For Selected PANs, you have to select PANs from the given list. Validation Screen will appear. Enter validation details. This will also generate an authentication code. Amount must be entered in 2 decimal places. If for some reason , you need to submit request for download again , you will not be asked to enter validation details again. In such case, you can simply enter “authentication code” and proceed. A : Download Form 16A file has a checksum and you may have tried to open it in notepad and edited it. Download again and do not edit anything in the file. Blog Review : 1,60,000 views in Year 2012 ! December 31, 2012 12:10 PM / 3 Comments on Blog Review : 1,60,000 views in Year 2012 ! Fast Facts is excited to share excerpts from the annual report of this blog prepared by The WordPress.com stats helper . The busiest day of the year was December 27th with 1,809 views. The most popular post that day was TRACES : new TDS web interface from Income-tax Dept.. Most commented on post in 2012 was TRACES : new TDS web interface from Income-tax Dept. We look forward to serving you again in 2013! Happy New Year! File Validation Utility version 3.6 has been released on Sept 25, 2012. FVU version 3.6 will be mandatory w.e.f October 16, 2012. Upto October 15, 2012 FVU version 3.5 and FVU version 3.6 will be applicable. This means for Q2 of FY 2012-13, both FVU 3.5 and FVU 3.6 will be accepted, if filed on or before October 15, 2012. For Q4 Salary details are to be provided in Form 24Q. The exemption limit for senior citizens above age 80 is different from senior citizens above 60 years and upto 80 years. TDS not deducted on software purchases in terms of Notification 21/2012 is now to be reported separately. Finance Act 2012 has amended the definition of “royalty”. The amendment in section section 9 (1) (vi) now defines ‘royalty’ as any ‘right for use’ or ‘right to use’, a computer software (including granting of a license), irrespective of the medium through which such right is transferred. A mandatory fees of Rs. 200 per day is applicable for any delay in furnishing of eTDS statement. Such fees must be paid before filing of eTDS statement and shown appropriately therein. 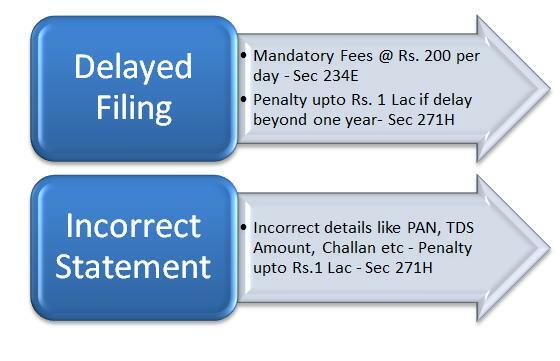 A delay beyond one year will result in penalty ranging from Rs. 10,000 to 1 lac. There is only one change brought about by fvu 3.5 and it is in respect of BIN – Book Identification Number. AO has to communicate the BIN details to the respective DDO.BIN is to be quoted by the Drawing and Disbursing Officer (DDO) in transfer voucher details in their quarterly TDS/TCS statements.